This worldly necklace captures the spirit of adventure. Fall in love with the free spirit of this charming two-piece medallion. 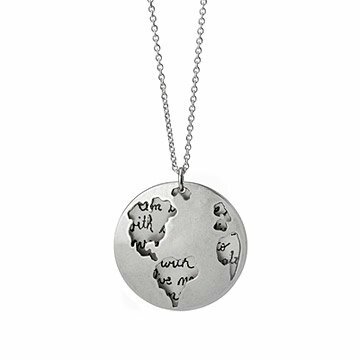 The sterling silver design by Britta Ambauen features a cut out world map over a shimmering back piece etched with the words, "I'm in love with cities I've never been to and with people I've never met." Inspired by the bonds we all share, this symbolic necklace embodies a love of the world around us and the adventure that awaits. Handmade in Seattle, Washington. Gently rub the surface of the pendant and chain with a jewelry safe polishing cloth to remove tarnish and dirt. My friend loved the necklace. It was a perfect size and length. She is petite, so the length was good but I could see it being short for taller people. The medallion was well made and in great condition. Too shiny and quote listed on site is not the quote it comes with. Site states "places I've never been to", necklace says "cities I've never been to". Like the other one better. Very shiny, too short of chain. Noticed my first review did not get published, but gonna keep writing it until they fix the description so this expensive necklace doesn't get sold to another person wanting it how it's described and pictured on site.